ClassiBase classifieds script › Forums › General help › How to Increase Max File Size? This topic contains 3 replies, has 2 voices, and was last updated by ClassiBase 4 years, 10 months ago. File size is defined as 2 MB for all images uploaded to ad. if you have 10 images then it is 200Kb per image. if you have 5 images then it is 400kb. if 2 images then 1 MB . to change this limit you have to edit /sys/app/models/Adpics.php file, upload() menthod. on line 129 edit $upload_config['max_size'] = '2000'; value change to 20000 or any value you want. These changes will be deleted on script update so remember this when updating script. Alternatively you can use vqmod to make changes to files on the fly. but you have to do it on your own because it requires advanced php knowledge and we cannot provide support for vqmod. Could that option be set via admin settings, in a next release, as a maximum per picture? In that way, no core file would be changed by users, and nothing could be lost in an upgrade. 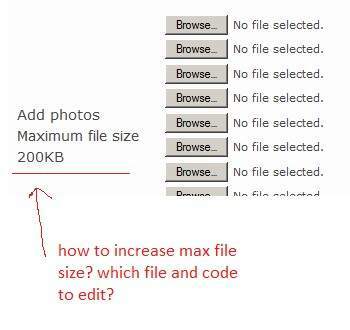 Reply To: How to Increase Max File Size?